When you want the jean look for your travels, but you want light and easy care, this is perfect pair of pants. The new KÜHL KLIFFSIDE™ JEAN is constructed of innovative DURALUX™, a durable softshell fabric that feels like cotton to the touch. Stronger, more breathable, and boasting superior anti-abrasion and quick dry properties, DURALUX with DWR outperforms standard nylon and provides UPF 50 sun protection. Featuring a STRAIGHT FIT and 15.5" bottom leg opening. 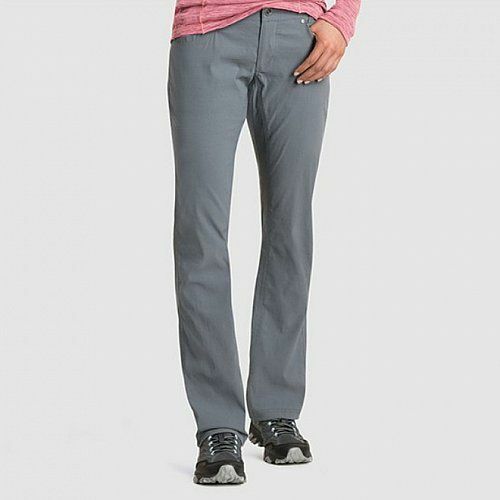 KÜHLKURVE™ fit (hugs higher in the back, mid-rise front), stretch fabric, and micro-chamois lining at the waist make these jeans extremely comfortable. The KLIFFSIDE JEAN features traditional 5-pocket styling. The internal drawcord provides a custom fit, while reinforced grosgrain ribbon at the inside bottom hem adds durability.